Our Big Daddy Morpheus came into our lives gradually and almost in a rescue fashion. We were living in Hawaii at the time and frequented the Kaneohe Petco to get our rat supplies. Typically we would say hi to all the ratties there, and one day there was only one. He was all alone, seemed very nice, and I wished him good luck finding a good home. Each month when we would return to stock up he was still there; still alone. On the third trip I told my fiancé that if he was there he was coming home with us and that was exactly what happened. It was apparent that he had some sort of neurological issue that was unique. He would raise his head in the air and wave it around every 8-10 seconds like clockwork; a very unusual behavior. Upon taking him to the vets we we’re told he was extremely healthy and should be able to get on fine, despite his apparent disability that the vet could not pinpoint. Time drew on, Morpheus was introduced to his sons, and he quickly became the king of his own little pack. That story alone makes me so happy for him, but it gets even more interesting. I moved to Seattle for work, and after 6 months could afford to fly the whole family over. We had found an amazing exotic vet, Dr. Kamaka, up in Mountlake Terrace just north of Seattle proper that we became very happy with and highly recommend to anyone in the area. After we had settled into our new home in South Seattle we noticed a bump on Morpheus’ right cheek. Over two weeks it swelled up to incredible size, negatively affecting his mood, causing pain, and prompting a visit to our vet. While we had to wait two days for our appointment we did research and began giving him oral doses of equal parts powdered reishi mushroom and raw honey to prevent any more growth. Reishi (Ganoderma Oregonense) is a medicinal mushroom that has been found to stop growth of cancer cells. That was seven months ago. He was diagnosed by Dr. Kamaka with a terminal zymbals gland tumor (ZGT) and given 3-4 weeks to live. Rather than lancing the mass and removing the sac she opted to pop it like a zit to relieve the pressure on his eye and advised us to keep him comfortable in his last weeks. If we felt he was in pain she gave us the option of calling in a prescription for some pain meds thru her. In the meantime she said to keep giving him the reishi/honey mixture to prevent any infection and help with pain. Since cannabis is legal here in Washington State we asked her what she thought about using that as treatment. She made mention of a couple who brought in a ferret who had a mammary tumor. They were medical cannabis card holders and opted to treat their baby orally with cannabis. Over two months of feeding their ferret cannabis every day the tumor disappeared and she was fine. Now, as vet, she couldn’t write a script for cannabis or recommend it in Morpheus’ case, but figured she would relay the story since we asked about it as a method of treatment. For those of you who do not know, there have been many clinical studies over the past 30 years that show organic compounds in cannabis are highly effective at neutralizing and killing cancer cells. Primarily among then are THC (tetra-hydro-cannabinol) and the less commonly known CBD (endo-cannabinoids). Cannabis contains over 85 CBD compounds and is one of the only plants to have potent levels of THC that boost the immune system upon oral/topical consumption. There are other plants used to create CBD oils, and while effective, they are not as strong as cannabis extracts and lack THC. We went home and continued treatment with reishi/honey. The skin overlapping the now depressed mass soon became necrotic, turned black, and fell away. The tumor quickly grew out of his face, overlapped his eye, ballooned into his ear, and almost reached the size of his head. We began to not only give him the mixture orally as we had been, but applying it topically to the mass. Our thought was that if reishi stops cancer growth, then this should work. At the very least it stopped all bleeding that resulted from him scratching the tumor and it growing so rapidly. Even with that, the mass blackened, continued to grow, and we feared the worst. Morpheus, just before starting treatment with the cannabis salve. Then a friend who is an herbalist gave us some CBD cannabis/oregano oil to use as a last option to ease his pain. Surprisingly it did—his demeanor improved within two days—AND it started eating away the tumor! We have been applying the oil/salve 3x-4x daily for just about 7 months now. At first we didn’t know how much to apply how often so started with once a day. From researching other people using cannabis oil on their pets’ tumors we quickly learned that the more often you apply it, the faster the healing result. So we stepped it up to 3x-4x daily. Now, as all of us know, sometimes our human lives found us getting caught up in work/daily life, being away from home, and sometimes unable to apply the salve so frequently. This experience taught us just how fast things can turn around for the worst. If we missed even one treatment, the cancer would gain strength and begin to balloon outwards again. These cells are incredibly resilient and will grow VERY quickly if not kept at bay. Keeping up with regular application is essential in staying on the winning side of the cancer battle. We found that taking 0.5-1cc of the salve and giving it to him orally seemed to help as well; at least with his pain and mood. 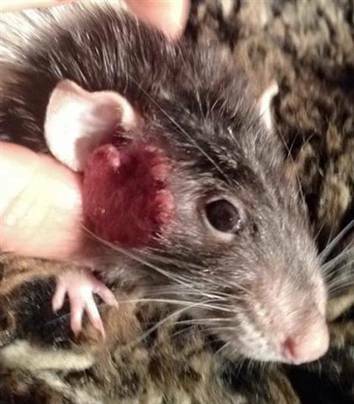 The tumor is now flush to his face, skin is growing back in places, and he can see out of his eye again. He often gets porphyrin drainage out of that eye, but it’s nothing major. I do partially contribute the success we have had with the cannabis salve to his tumor mass being exposed to the air and not underneath skin. That factor alone allows for a sure and direct application to the cancer cells, and does not have to rely on skin absorption of the salve to soak the tumor underneath. Morpheus in February 2016, next to the “miracle” salve. Since having such incredible success with Morpheus’ tumor we have begun to use it on growths his children begin to have. His daughter Violet has a mammary tumor near her urethra that grew to the size of a grape in two weeks before we began treating it. Since then it has not enlarged. One of Morph’s son’s, Big Bear, has a pea sized lump behind his left leg that too has not grown since we began topical application of the salve to it. They both get the same oral dose their Big Daddy gets, and we hope that over the coming months their tumors will shrink and disappear. Time will tell for certain, but we remain hopeful. Our friend makes the salve at home with coconut oil, oregano oil, cannabis extract, lavender, rosemary, and bees wax. 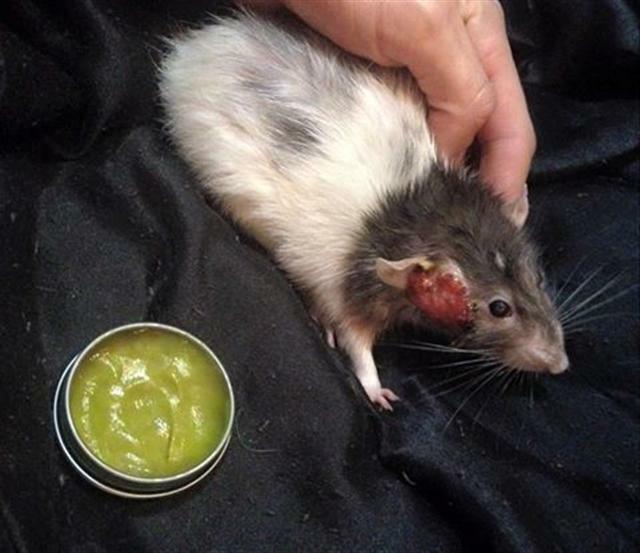 This cannabis salve is amazing, has given us many precious extra months with our Big Daddy, and I had to share our experience with everyone on the Rat Fan Club group on Facebook. That is where Debbie heard about our story and asked if we could share it with you here. We want everyone to know that this treatment takes time to work (and legal use thereof depends on where you live). It is not an overnight cure by any means, and you have to be VERY diligent with the applications. From all I’ve read on ZGT is that he should have passed away many moons ago. Instead he’s still living it up as king among his five boys and five grandsons here in Seattle; waving his head around like he always has in his special unique way that even our vet doesn’t quite understand. Having celebrated his third birthday this week he is happy and so are we. Update: Morpheus lived comfortably until the end of May! 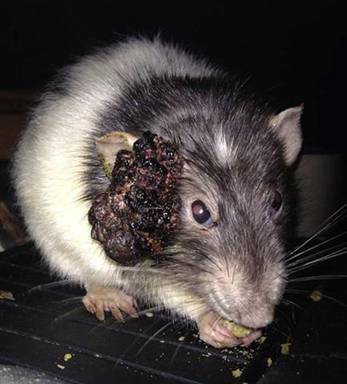 What an amazing story providing hope for rat lovers everywhere! To order the salve you can email Becca Jones at Naturelbelle4u@gmail.com and send her money via Paypal.